We are excited to announce that MetaSlider users now have the option of using the all new Unsplash.com library feature. When creating a new slideshow in MetaSlider, you now have the option to search and add images from a Unsplash.com tab that behaves just like your very own personal massive media library. This incredibly handy new feature means there is no need to leave your WordPress page to search for images, and then try to remember where they are saved when adding them to your slideshow. 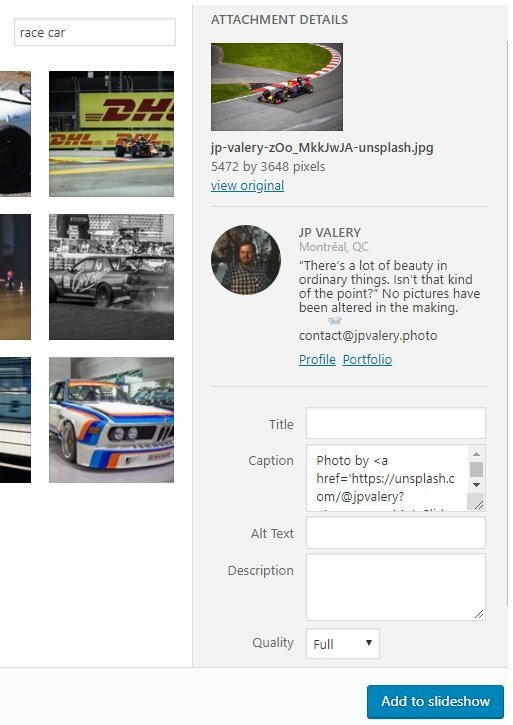 With our new feature, the search and upload of images with Upsplash.com can now all be done from within the MetaSlider plugin. Upsplash.com has over 850,000 completely free to use (do whatever you want with them) high-resolution photos that have been contributed by a large community of photographers from all over the world. Thousands of additional photos are added every day, with the types of images available covering a huge amount of topics and themes. With so much choice there is a very good chance that Upsplash.com has the type of photos you are looking for. Just select “Add Slide” and click on the “Unsplash Library” tab. Use the “Search unsplash.com” search option to find the images you want. Select your favourite and click “Add to slideshow”. The Unsplash.com image you added automatically uploads to your library and is added to your new slideshow. It really is that easy! MetaSlider is available for download here. Sign up and download it to your WordPress website today and let the fun begin. If you have any comments about the latest update, be sure to let us know in the comments below. The post Access and upload images directly from Unsplash.com with the latest MetaSlider update appeared first on UpdraftPlus. UpdraftPlus – Backup, restore and migration plugin for WordPress.